Click on an area in the Google map to link to a detailed plan in East Melbourne. 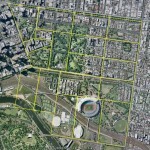 MMBW master plan and index to detailed plans covering Collingwood, Essendon, Fitzroy, Footscray, Melbourne, East Melbourne, Port Melbourne, Richmond, South Melbourne, Williamstown. MMBW detailed plan of East Melbourne published in 1899 covering Victoria Parade, Powlett Street, Grey Street, Clarendon Street, Albert Street, Eades Street and Fitzroy Gardens. MMBW detailed plan of East Melbourne published in 1899 covering Grey Street, Powlett Street, Hotham Street, Clarendon Street, Gipps Street and Fitzroy Gardens. MMBW detailed plan of East Melbourne published in 1899 covering Powlett Street, Victoria Parade, Hoddle Street, Grey Street, Albert Street and Simpson Street. Author: Melbourne and Metropolitan Board of Works. MMBW detailed plan of East Melbourne published in 1898 covering Hotham Street, Hoddle Street, Wellington Parade, Powlett Street, Simpson Street and George Street. MMBW detailed plan of East Melbourne published in 1899 covering Hotham Street, Powlett Street, Wellington Parade, George Street, Clarendon Street and Fitzroy Gardens. MMBW detailed plan of East Melbourne published in 1899 covering Treasury Place, Lansdowne Street, Wellington Parade, Flinders Street, Spring Street and Treasury Gardens.